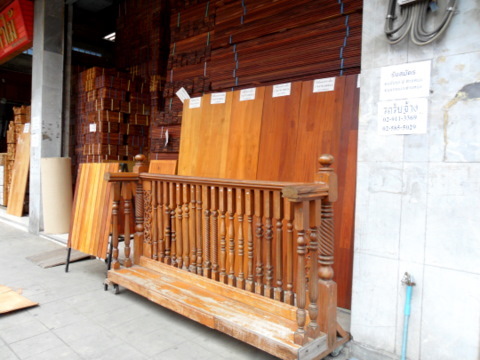 Soi Pracha Rat 24 in the Bang Sue district of Bangkok is a street well known for wood furniture, decor and handicraft. The soi is home of the Pracha Narumid community that has produced carpenters, wood carvers and wood craftsmen renowned for their handicraft. The area is a living example of a local trade that grew over the generations into a community and has continued as a community. and decorative pieces, engravings, letter boxes, statues, screens, wood sculptures and walking sticks. Please the map to Soi Pracha Rat 24. 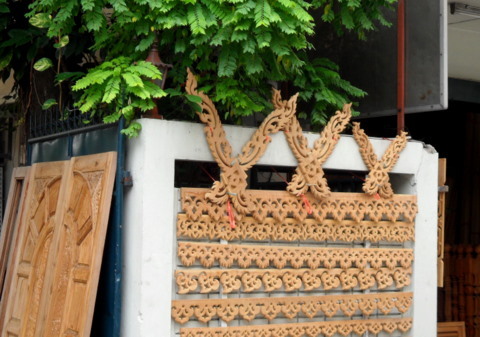 Watch the craftsmen at work as they chip away on elaborate motifs on wood panels or carve ornate wood sculptures, providing a demonstration of exquisite Thai wood handicraft. 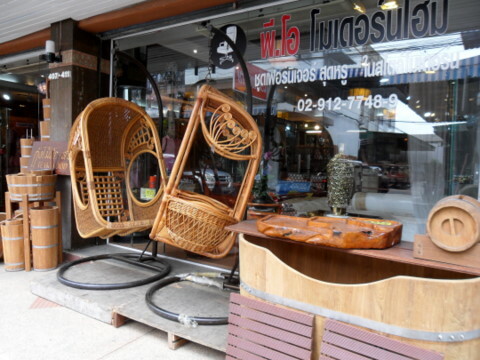 The soi is a must for lovers of wood furniture, decor and handicraft. Every year since 1999, a street fair is held in late February or early March in this street. Art lovers and collectors gather to view the woodcarvings, handicraft and furniture produced by these carpenters and wood craftsmen. The street is closed to traffic as shopkeepers display their wares along the street. Sculpture demonstrations, song and dance displays create the festive atmosphere while visitors view the wood handicraft on sale at discounts. 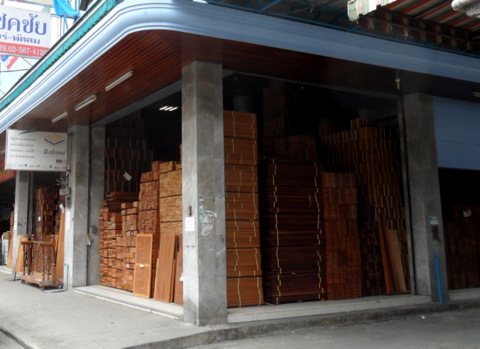 Further in the soi, wholesale merchants deal in timber, wood panels and wood flooring, a useful source of supply for those planning to build a new home. 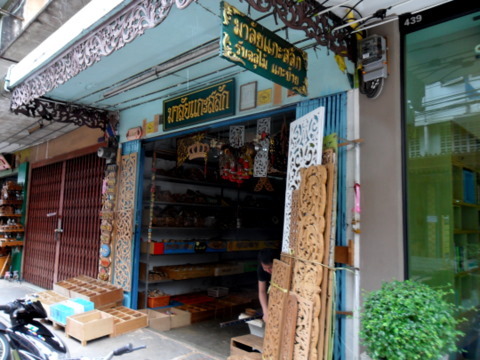 This Bangkok community grew up around the wood craftsmen trade and has survived the pressures of the modern economy and urbanization. Traditional skills have been preserved within the community to strengthen the local economy and keep the community with its distinctive character alive. The first time I visited this place was in 2005/2006. So I thought it would good to take another look and see how things are now. The construction of the Purple Line is in progress with the support pillars constructed along Krung Thep – Nonthaburi Road. So visitors will be able to take a skytrain here in future. 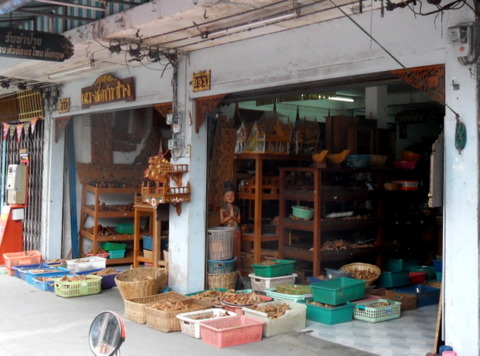 The nature of some of the shops in the soi has also changed. Modern shops have sprung up along street. These new furniture shops have departed from the traditional all wood furniture with natural stains. 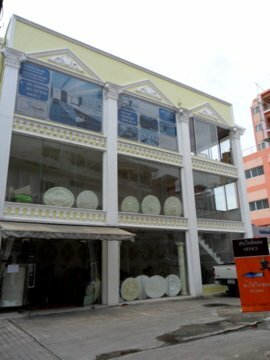 What’s more, the new shops are now housed in spanking new buildings. 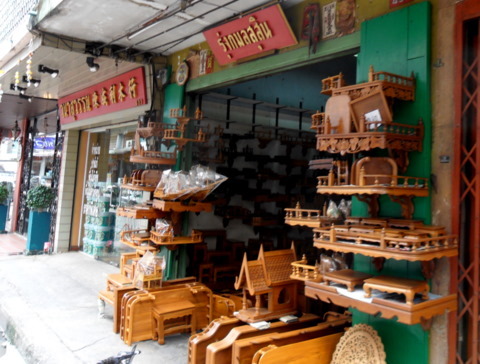 However the traditional wood craftsmen shops are still around. So are the timber wholesalers. 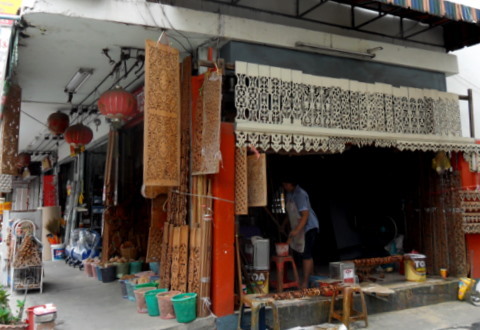 Then there are those shops that try to blend new décor with traditional craft. How much longer can the old exist with the new? Or can we expect to see a completely new face to Soi Pracha Rat 24 in years to come? Soi Pracha Rat 24 is also known as Soi Pracha Narumid, after the name of the community living there. The landmark in the area is the Bang Po junction. If you're coming from the city, proceed along Pracha Rat Sai 1 Road till you pass the Bang Po junction. Soi Pracha Rat 24 is a further 300 m on the right. The following bus services from the city pass Pracha Rat Sai 1 Road. Air conditioned service No.16 from Siam Square passes Pracha Rat Sai 2, then turns into Krung Thep-Nonthaburi Road. 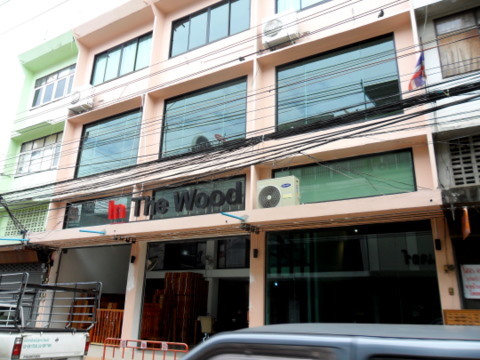 Drop off near Soi Krung Thep-Nonthaburi 5. This leads to the same soi as well. Another way to get there is by Chao Phraya river boat to the Bang Po Pier; the soi is about 500 m walk from the pier. 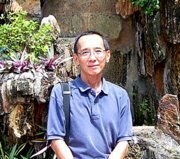 For other Bangkok Communities and other forms of traditional Thai art.